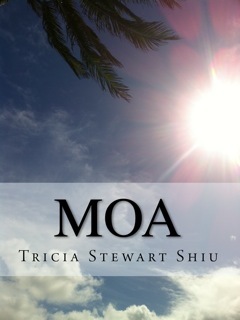 Please enjoy this excerpt from Moa, a paranormal YA novel with a literary bent by Tricia Stewart Shiu. Then read on to learn how you can win huge prizes as part of this blog tour, including $6000 in Amazon gift cards, a Kindle Fire, 5 autographed copies of Moa, and 5 autographed copies of its sequel, Statue of Ku. I hover just beyond her “outer shell”—a movement in the periphery, a faintly familiar scent, a fond memory just beyond recognition, a non-human observer. Before the week is up, Hillary will save my life, as I will hers. But, for now, more about Hillary. The drink cart rolls past the blanket, which has, by now become a moist steamy cave. “Hey, freak. I hope your plane crashes.” The memory reverberates through her brain despite her attempts to distract herself with the hypnotherapy recording. She increases the volume, but the ugly conversation, which occurred just before school ended, still haunts her mind. “I guess the only people they check on those flights are the suspicious ones,” Krystal Sykes, a bully from her home room, leans in as Hillary hastens to grab books for her next class. Krystal, also a senior, has hounded Hillary since the first day of freshman year and this is the final day during the final hour at this tiny high school of 376 students —where everyone knows everyone else’s business. “Look, Krystal.” Hillary turns her eyes toward the sneering blonde. “It’s the last day of school, we’ll never see each other again. Can you give it a rest?” These are the most words the two young women have exchanged in the entire four years of high school. A look of shock replaces Krystal’s smug snick, “Oh, so now you talk.” She leans in, so close that her spray tan becomes a patchy Impressionist painting. Her pores are blotched with cakey, two shades too dark powder, her unblended cream eyeshadow creases across the center of her lid and her tropical breeze flavored breath threatens to strangle the words right out of Hillary. “I know all about your witchcraft practices and have made a few spells of my own. Trust me. You’ll never make it to your sister’s house in Hawaii.” Krystal’s backpack jingles and Hillary watches her spin around and skip down the hall. Hillary is not a witch. She has, however, carefully crafted a “shell” to protect herself from bullies like Krystal—who, as far as Hillary can tell—is not a witch either. She has watched Krystal throughout elementary, middle and high school and has not been able to discern whether or not she practices witchcraft. No matter what Krystal’s background, her intent is to harm. And there is nothing worse than a spell with an aim to hurt. Hillary has had no choice but to remain in a constant state of defensiveness. The twenty-minute recording ends and Hillary falls into a troubled sleep—feeling every bump and hearing every creak of the plane. With about an hour left in the flight, Hillary awakens with a “turtle headache.” Hillary’s older sister Molly taught her this term which means a headache caused by sleeping too long underneath the covers of one’s bed. Sadly, Molly lost her husband, Steve, last year in an unfortunate surfing accident. The throbbing pain in Hillary’s left temple could be the result of remaining submerged beneath an airplane blanket and wedged between the window and armrest, or it could be from worry about how Molly and her niece, Heidi are dealing with their devastating loss. Disoriented, Hillary pokes her head out just in time to glimpse puffy clouds and sparkling sea below. A flood of excitement and sheer wonder flows through Hillary in the form of a tingle from her head to her toes. And then, a lovely thought: “...And for an Everlasting Roof, The Gambrels of the Sky...” She will enjoy this plane ride, thanks in part to Emily Dickinson. About Statue of Ku: The second book in the Moa Book Series, "The Statue of Ku" follows Hillary and Moa as they jet to Egypt on the Prince’s private plane to reclaim Moa’s family heirloom, the inimitable statue of Ku. Get it on Amazon. to the written word with her avid interest in the healing arts and all things metaphysical in her novels Moa and Statue of Ku and looks forward to finding new ways to unite her two loves. Visit Tricia on her website, Twitter, Facebook, or GoodReads.